Housing data can be a leading indicator of broader economic trends. Learn about the most widely followed reports. Strong houses and strong economies are each built on solid foundations. That helps explain why housing market data tends to be an ongoing fixation of economists and market professionals, and why housing numbers often move prices for equities, bonds, and commodities. For investors and traders, understanding housing market trends can help with examining where the economy and markets may be heading. People spend serious money, not only on their houses and other dwellings, but also on what goes inside them. This means that housing data can be a leading indicator of retail sales and other economic activity months in advance. In 2018, the total value of the U.S. housing market was $33.3 trillion, up 6.2% from 2017, according to Zillow Group. Search for data and you’ll find a myriad of reports from the U.S. government and other sources, some more market-moving than others. The following monthly reports are among the most widely followed by professional investors and traders seeking insight on housing market trends. It’s worth noting, however, that each of these indicators is backward looking. So although it may be tempting to make market projections from these and other housing data points, remember that past performance does not guarantee future results. Unlike backhoes and bricklayers, home price patterns aren’t necessarily obvious from street level. But home prices over the longer term do influence consumer sentiment and behavior and factor into broader economic health. We learned this the hard way from the Great Recession of 2008–09, which was preceded by a sharp climb in real estate values, followed by a steep nosedive that took the rest of the economy with it. The S&P CoreLogic Case-Shiller readings, which are compiled by a research group, track monthly changes in the value of residential real estate in 20 U.S. metropolitan regions (and the country as a whole). The indices measure changes in existing home prices and are based on single-family home resales. Real estate is very local, but Case-Shiller has long been followed as a broader bellwether for home values and related factors, such as how consumers are responding to interest rates. 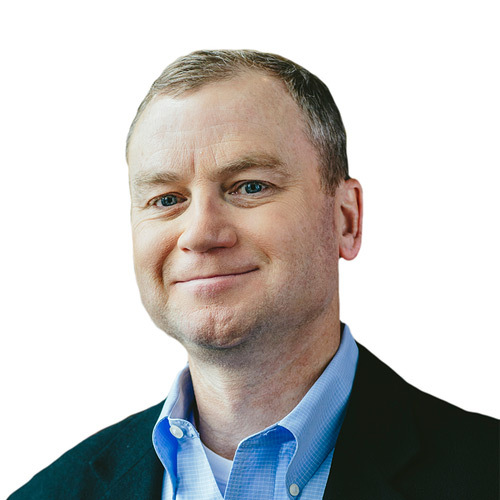 Want to get housing data on the thinkorswim platform from TD Ameritrade? Under the Economic Data tab, select Prices > House Price Indexes. From there you can access all the Case-Shiller data—national, regional, and local—and hundreds of other housing numbers. See figure 1. FIGURE 1: DATA GALORE. 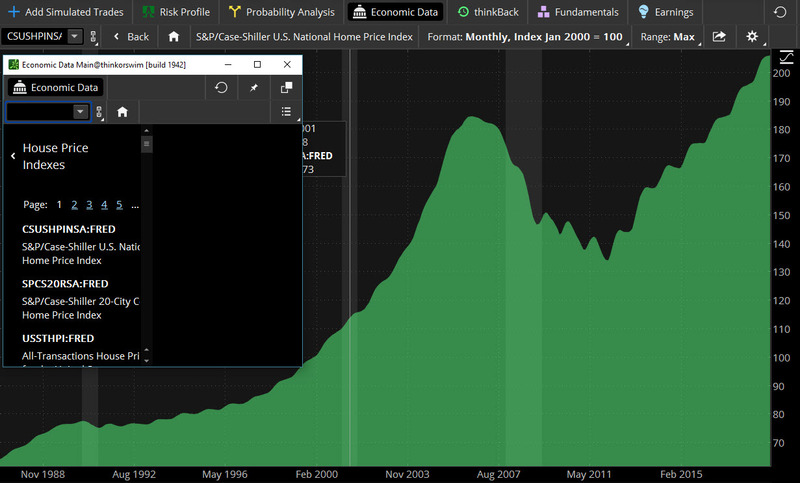 Pull up the S&P CoreLogic Case-Shiller Index, plus hundreds of other housing data points, under the Economic Data tab in the thinkorswim platform. Data source: the Federal Reserve FRED database. Chart source: the thinkorswim platform from TD Ameritrade. For illustrative purposes only. Past performance does not guarantee future results. FRED® is a registered trademark of the Federal Reserve Bank of St. Louis. The Federal Reserve Bank of St. Louis does not sponsor or endorse and is not affiliated with TD Ameritrade. 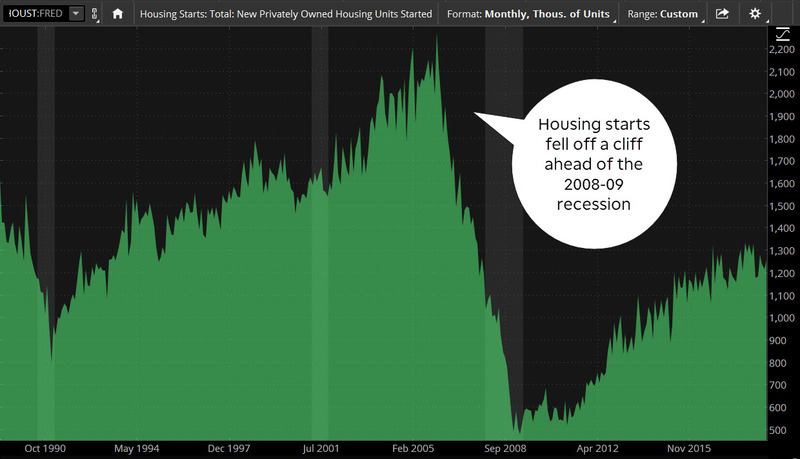 Starts and permits, released by the U.S. Census Bureau, are among the most “market-moving” of any housing indicator. Why? Call it the ripple effect. Housing starts, which are registered at the start of the construction of a new building, reflect the commitment of builders to new construction, and builders don’t usually start excavating for a new house unless they’re confident it’s going to sell. New homes require construction workers, and once someone buys a house, other purchases follow: couches and coffee tables, dishwashers, flat-screen TVs, landscaping services, and more. See figure 2. FIGURE 2: LEADING INDICATOR? Housing starts trended higher in the 1990s and early 2000s, but then fell precipitously from more than 2.2 million a month in 2006 to fewer than 500,000 in April 2009. Data source: the Federal Reserve FRED database. Chart source: the thinkorswim platform from TD Ameritrade. For illustrative purposes only. Past performance does not guarantee future results. FRED® is a registered trademark of the Federal Reserve Bank of St. Louis. The Federal Reserve Bank of St. Louis does not sponsor or endorse and is not affiliated with TD Ameritrade. How might the markets react? If housing starts come in lower than expected, for example, bond prices may rally due to concern over slowing economic growth (bond prices move inversely to bond yields). 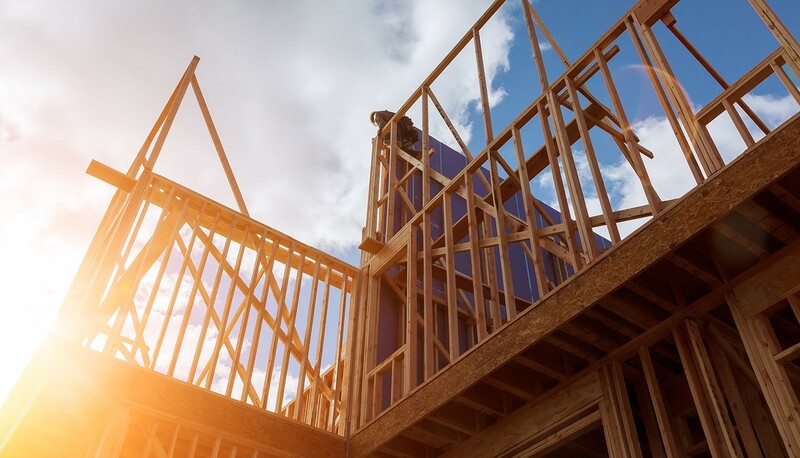 In contrast, stronger-than-expected housing starts may send bond prices lower (and push shares of homebuilders higher) because an increasingly robust economy raises the specter of higher inflation, which erodes the value of bonds and other fixed-rate investments. Also compiled by the Census Bureau, new home sales measure the number of newly constructed homes with a “committed” sale during a month. Considering at least a few hundred thousand households are buying new homes every month, the economic ripple effect can be substantial, Econoday says. This report, from the National Association of Realtors, tallies the number of previously constructed homes, condominiums, and co-ops for which a sale closed during the month. Existing home sales (also known as home resales) account for a larger share of the market than new homes and can also signal broader housing market trends, which makes this report a gauge of demand for housing and overall economic momentum, according to Econoday. “People have to be feeling pretty comfortable and confident in their own financial position to buy a house,” the firm says. As with housing starts, there is a multiplier effect. Even though home resales don’t always create new output, the sales generate revenue for real estate agents, and “myriad consumption opportunities for the buyer,” Econoday says. No matter where you are in your investing journey—active trader, long-term investor, young saver, retiree, or anything in between—you’re connected to the housing market as an owner or renter. For many Americans, home equity represents a sizable chunk of the nest egg. And from a fundamental standpoint, housing market trends are directly connected to consumer spending, which accounts for roughly 70% of the economy.